Hastings United’s footballers are eager to continue their recent love affair with the FA Cup. The U’s will travel to Herne Bay in second round qualifying today (Saturday) seeking a 12th victory in the world famous competition over the past four seasons. It’s away from home and I think it will be tough. I think it will be a good entertaining game. United manager Garry Wilson said: “It’s away from home and I think it will be tough. I think it will be a good entertaining game. The U’s have seen off Cray Valley Paper Mills and Thatcham Town in the previous two rounds to set up what looks a hard-to-predict meeting with Herne Bay. The north Kent opposition lies sixth in Ryman Football League Division One South with 18 points from 10 games. United are six places and three points worse off, but have won all of their last four games against Herne Bay without conceding a goal. Herne Bay had two players sent-off in the previous round and United one, but Wilson believes effort will be more important than discipline tomorrow. United have won five and lost five of their first 10 league matches, and Wilson is crying out for some consistency. “We need to strive towards consistency in results, performances and individual play,” he continued. “I want to select a consistent team, but until we start to see a consistent performance, it’s really difficult. United’s squad looks very strong on paper, but it’s not quite clicking for them at present. The arrival of Billy Medlock late last week gives them an embarrassment of riches up-front with Jack Harris, Zac Attwood, Bright Temba and Tyrell Richardson-Brown also in tow. Jack Walder starts a three-match ban and Attwood is battling to shake off an Achilles problem which caused him to miss the 3-1 defeat at home to Worthing on Tuesday. * The club is running a coach to the game, leaving the Pilot Field at 11.30am. The cost is £12 for adults, with a £2 discount available to members of the supporters’ club, and £5 for all under-18s. Contact Dave Russell on 07970 332270 or email davidrussell881@hotmail.co.uk to book a place. Emirates FA Cup, 2nd round qualifying: Herne Bay v Hastings Utd. Division 1: Bexhill Utd v Haywards Heath Town; Midhurst & Easebourne v Little Common. Division 2: Roffey v Westfield. Reserve Section (East): Westfield v Storrington. Macron East Sussex League, Premier Division: Hawkhurst Utd v Peche Hill Select; Hollington Utd v St Leonards Social; Robertsbridge Utd v Mountfield Utd. Division 1: Old Hastonians v Wadhurst Utd; Sovereign Saints v Ticehurst; The JC Tackleway v Hollington Utd II. Division 2: Little Common III v Eastbourne Athletic; Peche Hill Select II v Northiam 75. Division 3: Herstmonceux II v Bexhill Utd II; Pebsham Sibex v Orington; Sedlescombe Rangers II v Westfield III; St Leonards Social II v Hooe Sports. Division 4: Bexhill AAC II v Wittersham II; Grasshoppers Old Boys v Bexhill Rovers; Victoria Baptists v Hawkhurst Utd II. Division 5: Battle Baptists III v St Leonards; FC Westridge v Hampden Park Utd; Magham Down v Robertsbridge Utd II; Sedlescombe Rangers III v Sandhurst. Birchwood Group Challenge Cup, 1st round (2.30): AFC Hastings v Sidley Utd; Battle Baptists v Sedlescombe Rangers; Ore Athletic v Crowhurst. Wisdens Sports Challenge Cup, 1st round (2.30): Burwash v Mayfield; Hastings Rangers v Peasmarsh Utd; Icklesham Casuals v Bexhill AAC; West Hill Utd v Herstmonceux. 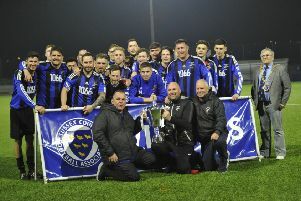 Eastbourne Coach Finishers Challenge Cup, 1st round (2.30): Conquest Utd v The JC Tackleway II; Hailsham Athletico v Battle Baptists II; Parkfield v Icklesham Casuals II.